Certain conditions were met on Friday that convinced me that gold is now entering the final leg up in this particular phase of the ongoing C-wave advance. The final spurt higher last year tacked on a very healthy 19% in a little over 1 month. A similar performance this year would drive gold to $1578. Although this year we have the added benefit that the entire sector is trading at new all time highs. It is the only sector in the world that is in this position. This is an incredibly powerful combination that could drive the precious metal sector even further than it did last year. At the moment there is a very low risk (-3%) entry for investors and traders to get on board this final run. I explained the setup in depth in the weekend report. For one day only I’m going to offer the 15 month yearly subscription rate again. That works out to a monthly price of $13.33. 15 months should be long enough to get investors not only through this final spurt higher but also back in for the final phase of the C-wave this spring. Get you out of the precious metals market in time to avoid the severe D-wave correction. And then back in to ride the next powerful A-wave advance. We have an incredible opportunity ahead of us over the next several months and year. If you want to take advantage of the discounted yearly subscription click here and follow the Paypal link. This entry was posted in Uncategorized on October 31, 2010 by Gary. There are three things I watch for as a sign that a correction is imminent. They are in order of importance, cycles, sentiment and money flows. The current cycle is already stretched to 45 days. Usually this cycle bottoms between 35 and 40 days so you can see we are now overdue for a top. That covers the cycles part of the equation. Sentiment has now reached bullish levels (contrary sign) that should be enough to force at least a daily cycle correction. We haven’t yet reached the extreme level that is normally required to turn the larger intermediate cycle. In bull markets it usually takes a push to new highs to get to that kind of extreme sentiment level. Finally I like to see some sign that smart money is exiting the market in preparation for a correction. For me that sign comes when we see a large selling on strength day in the SPYDER’s ETF. Today we got that final sign. 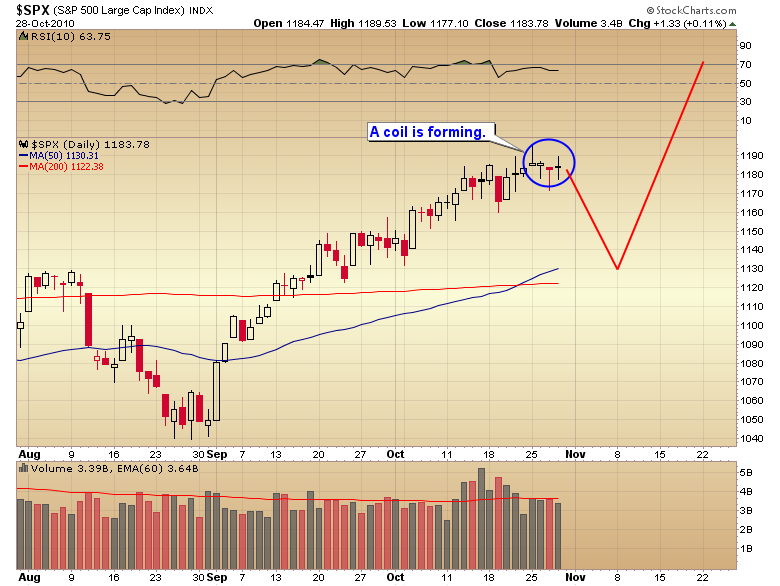 Not surprisingly we now have a volatility coil forming on the S&P chart. As most of you probably remember the initial move out of a coil is often a false move even though it is usually very aggressive. Typically the initial move will run 3 to 5 days and then reverse leading to a much more powerful and more durable move in the opposite direction. Since we are 45 days into the current cycle and we now have all three signs for a correction lined up I think the odds are strong this coil will break to the downside. 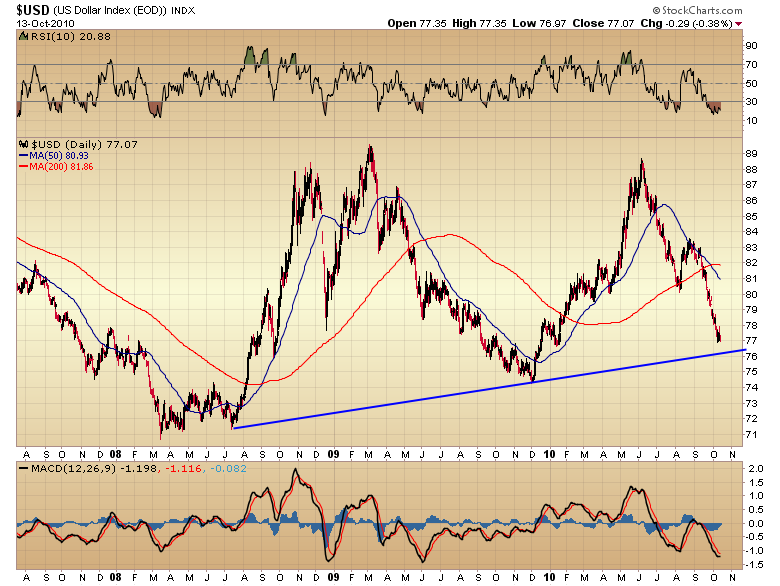 There are implications for the dollar and gold if this unfolds. I went over them along with a game plan in tonight’s report so I won’t repeat it here but I think we will likely see a correction soon and since we still haven’t eclipsed Monday’s intraday high it may have already begun. This entry was posted in Uncategorized on October 29, 2010 by Gary. 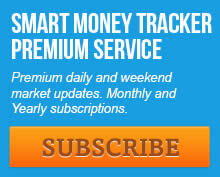 There is an intraday alert on the premium website for subscribers in case you didn’t get the morning email. This entry was posted in Uncategorized on October 27, 2010 by Gary. I’ve stated before that I expect this secular bull to continue until the Dow:gold ratio drops to at least 1:1. Considering how much further the ratio stretched on the upside (42:1) than any other time in history it’s entirely possible that we could briefly see gold become more expensive than the Dow. As it pertains to the current C-wave I want to point out that we still haven’t even seen the ratio hit new lows yet. Every C-wave so far has managed to drive the ratio to new lows before topping. The current C-wave still hasn’t accomplished that goal. I’m confident it will eventually. Possibly even driving the ratio down to 6. If we assume modest new highs on the Dow of 12,000 we could be looking at $2000 gold before this rally tops (probably next spring). It looks like we are going to form the swing low I mentioned in my last post this morning so the odds are now high that gold has put in the daily cycle low and the short term correction has run its course. If one doesn’t have a position it’s probably a good idea to get one and if one was waiting for a pullback to add to positions it looks like that’s all we are going to get. Depending on how the dollar reacts and how long it takes to reach the 74 pivot will determine how far and how aggressive the next leg up will be. I will elaborate in tonight’s update for subscribers. This entry was posted in Uncategorized on October 25, 2010 by Gary. Trying to pick a bottom in the gold correction at this point is probably a low probability strategy. The simple fact is that until gold forms a swing low there is no possibility of a bottom. So someone trying to jump in front of the correction might as well wait at least until a swing forms. Ultimately though we need the value investors to step in to the gold market. Of course its tough to guess ahead of time at exactly what level we are going to get enough value money come into the sector to halt the correction. I do have a couple of ideas of where that’s likely to happen, being somewhat of a value investor myself. The first level that should start to bring in big money is the psychological $1300 level. That level may or may not bring in enough money to halt the decline. We will only know after the fact of course. But if one wanted to try and pick a bottom that would be the first level to make an initial purchase. 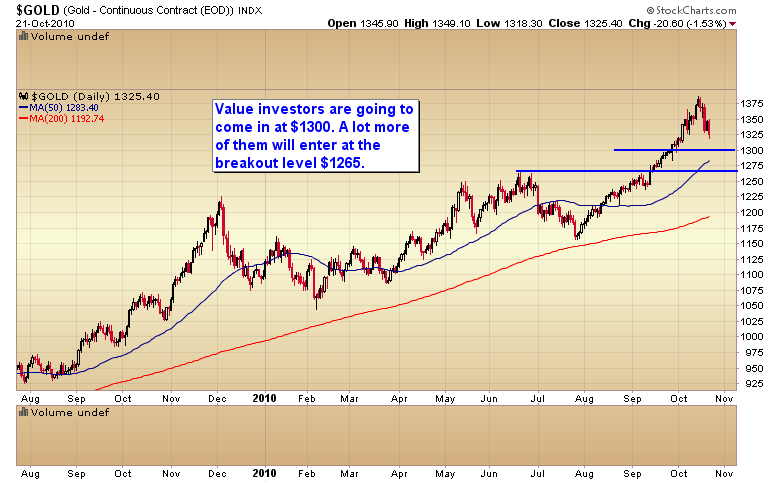 A much safer bet in my opinion would be if gold can correct enough to test the $1265 breakout level. I expect enough value money will enter the gold market at that level that it’s unlikely gold will decline significantly below that point. We have a bit of a dilemma right now. Similar to what happened back in January. 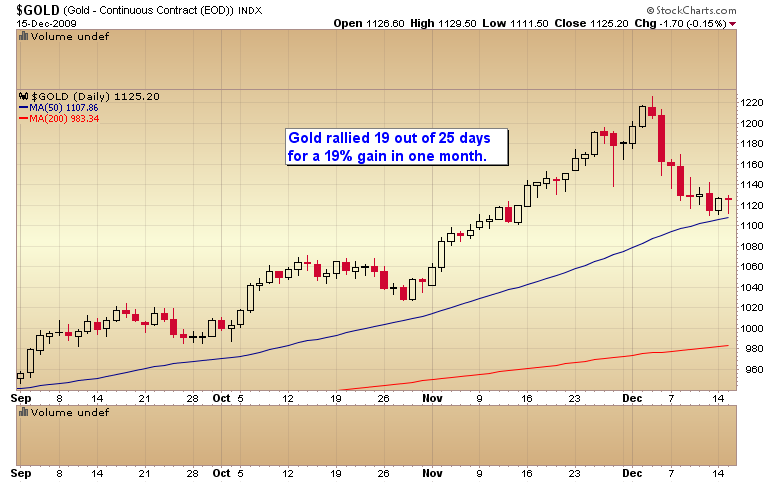 Gold has begun to correct but the stock market is still resisting. As soon as the stock market rolls over into it’s daily or intermediate cycle decline it’s going to put added pressure on the gold correction. So trying to prematurely jump into the gold market here is risky (in so much as one will probably experience a drawdown. Of course being a bull market any timing error will eventually be corrected). In a perfect world the dollar rally will strengthen and test 80 and in the process force the stock market to correct and gold to drop down to test the $1265 breakout. That’s the point where I would advise investors to step back into the market heavily. I expect you will have a lot of company at that point and your chances of a significant drawdown will be drastically reduced. This entry was posted in Uncategorized on October 22, 2010 by Gary. 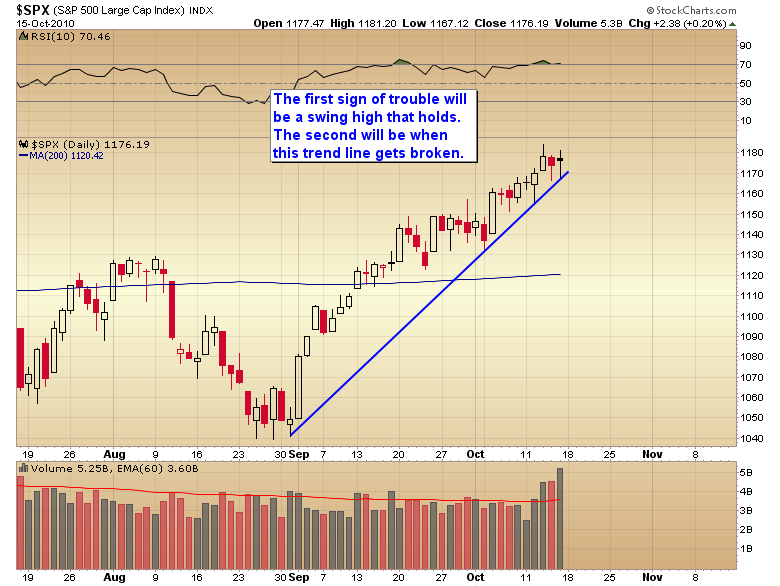 Yesterday the market broke the trend line off the August bottom. The dollar also followed through on it’s snapback rally. The odds are now high that we have the cycle top in place for stocks and the cycle low in the dollar. We should now see the market drift lower possibly till the third quarter GDP report next week. However let me stress again this isn’t over. This is just a profit taking event and once it’s run it’s course the dollar will resume what I fully expect to be a complete train wreck (especially if Bernanke is stupid enough to run QE2) as it continues to crash down into the yearly and three year cycle low. Initially this will push stocks higher, until surging inflation next year destroys the fragile economy. At that point the stock market will begin the next leg down in the secular bear market and the economy will roll over into the next depression. This entry was posted in Uncategorized on October 20, 2010 by Gary. 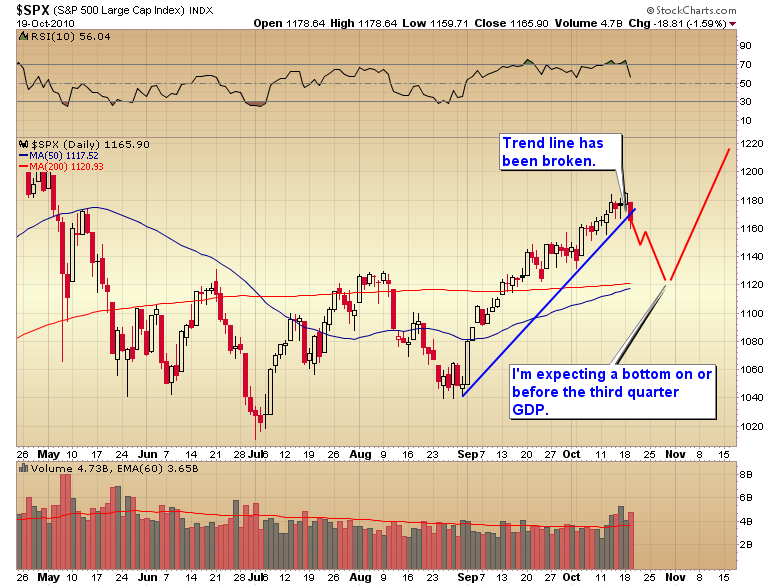 We’re now starting to see warning signs pop up that a correction is imminent. 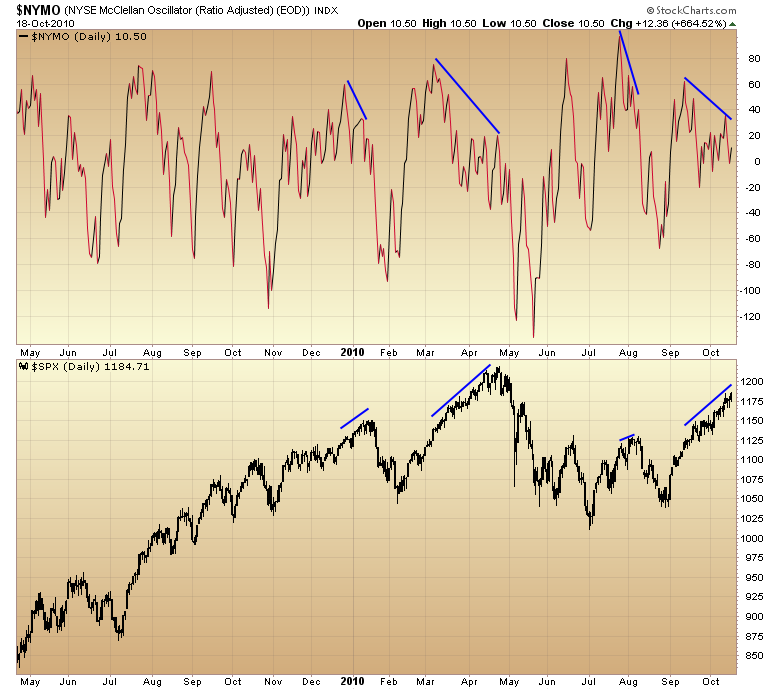 Despite the market making new highs breadth is diverging badly. Aka the market is being driven higher by fewer and fewer stocks. When this starts to happen late in the daily cycle a correction isn’t far away. We now have a large divergence in the McClellan oscillator. If we happen to see a down day today the slower 10 day moving average will turn down and join the faster 5 day average on the new high/ new low chart. Granted that doesn’t always lead to a correction but when it happens late in the daily cycle it’s a pretty reliable sell signal. We are now late enough in the daily cycle that these warning signs should probably be taken seriously. It’s probably too late to continue pressing the long side. To do so one risks getting caught in the down draft when the correction begins. This entry was posted in Uncategorized on October 19, 2010 by Gary. The stock market is now on the 34th day of its daily cycle. That cycle lasts on average about 35 to 40 days. So as you can see we are pushing the limits for a cycle top. We may have made that top on Wednesday. We’ll just have to see how next week plays out. 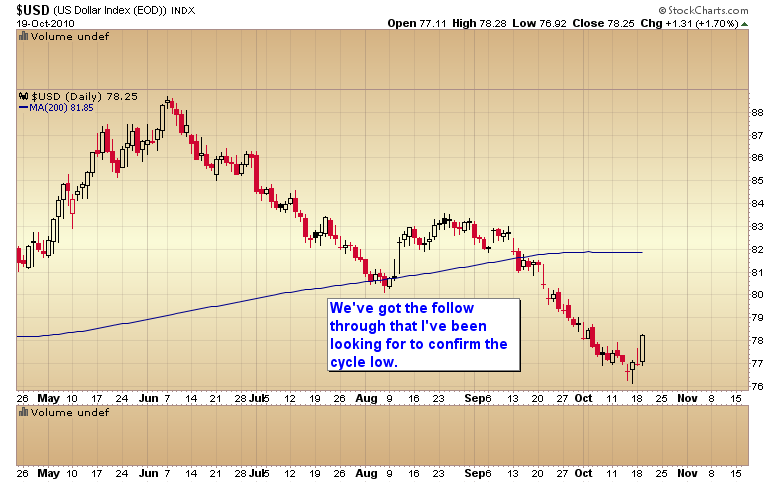 I also think the dollar may have put in a cycle bottom on Friday. 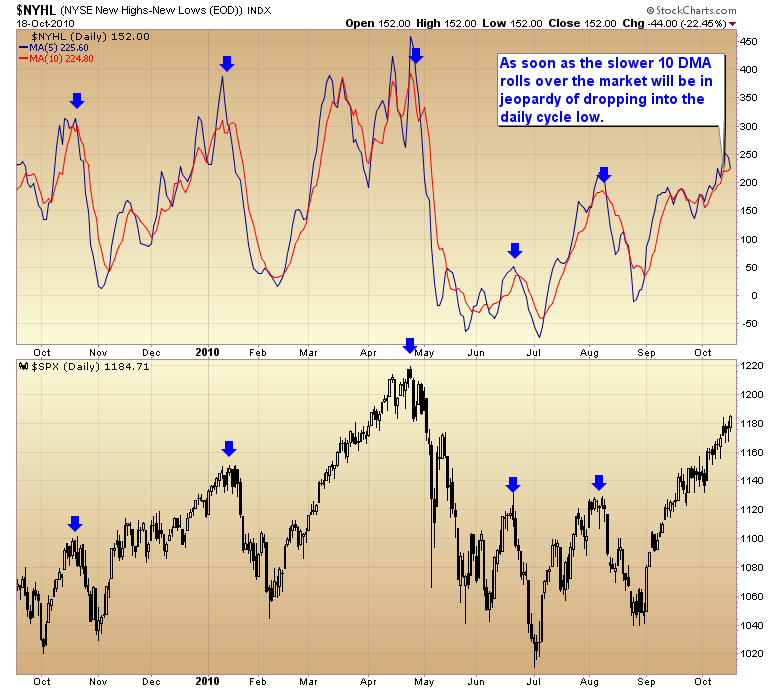 If it did then it is due for a snap back rally to relieve the extreme oversold conditions. This should pressure virtually all asset classes (the possible exception might be gold). At the moment I’m expecting the market to begin working it’s way down into a daily cycle trough possibly bottoming on the third quarter GDP report Oct. 29th. Any one still holding long positions might want to consider taking profits here, especially if the trend line gets broken next week. Once we get past the correction into the now due daily cycle low traders can probably re-enter long positions for a run at the April highs. 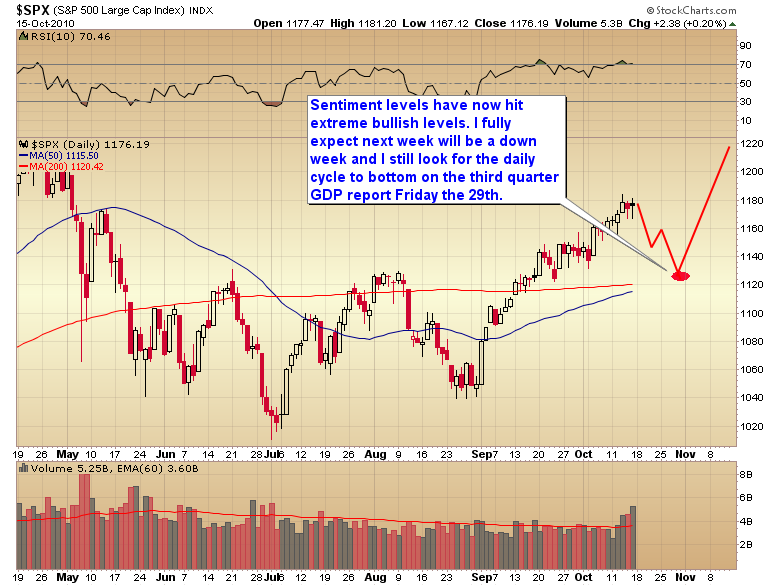 More in the weekend update for subscribers. This entry was posted in Uncategorized on October 16, 2010 by Gary. The dollar just sliced right through the 76.50 pivot this morning. Today also happens to be the 28th day of the current daily cycle. The normal timing band for a cycle to bottom is between 20-28 days, However the Fed’s threat to print, print, print appears to be going to stretch the dollar cycle slightly long this time. We will look for the next swing low to mark the bottom of the cycle and the beginning of what should be a counter trend bounce. That bounce should be of the dead cat variety as the intermediate cycle still has 8 to 12 weeks yet before an intermediate bottom is due. The next support zone now that 76.50 has been violated would be the rising trend line off the last 3 year cycle low in 08. Once the counter trend bounce begins it should pressure the stock market down into the now due daily cycle low. 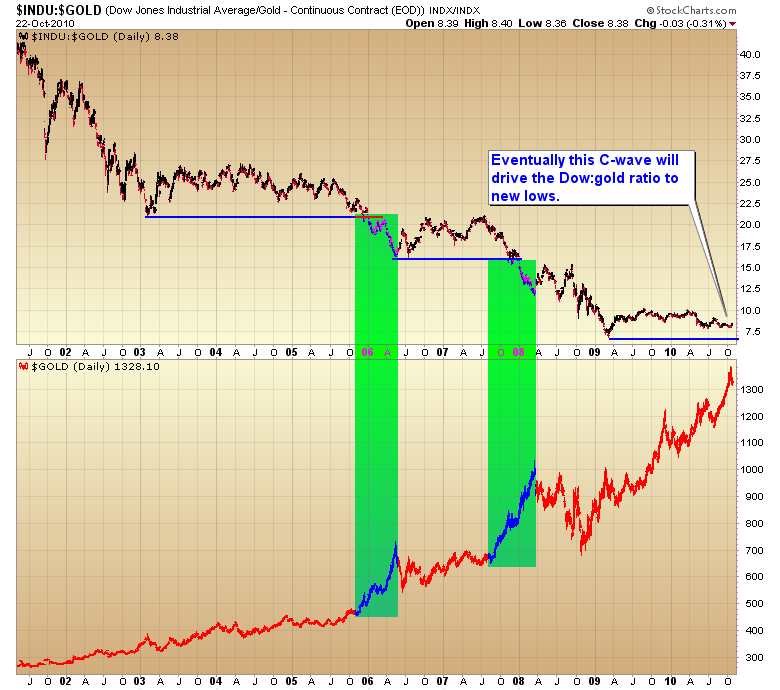 In theory gold should also drop down into it’s now overdue daily cycle correction. This entry was posted in Uncategorized on October 14, 2010 by Gary. The S&P has now formed a swing high and we finally have a little follow through on the dollar rally. We are late enough in the daily cycle that this should signal the beginning of the decline into the daily cycle low for stocks and gold. For the many reasons I’ve discussed in the nightly reports this correction shouldn’t last very long but it could be sharp. 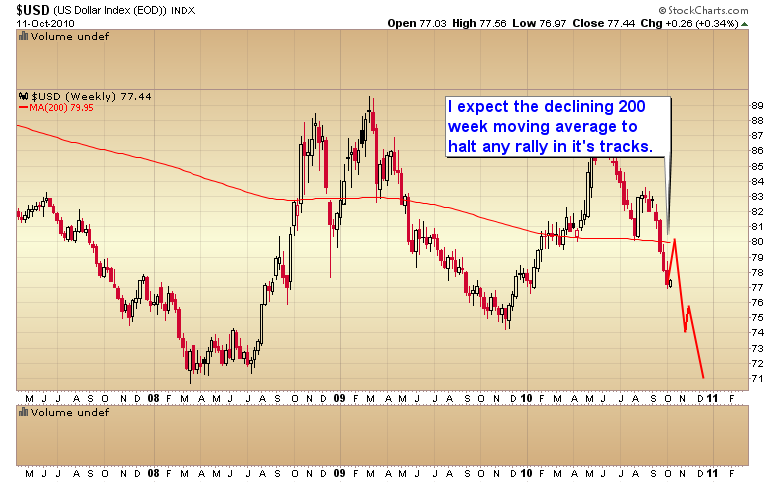 If, and this is a big if, the dollar can tag the historically significant 80 level which also happens to be where the declining 200 week moving average comes in that would be the point where one could take a shot at picking the exact bottom of the cycle. I really doubt we are going to see the dollar regain this major resistance level for the duration of this 3 year cycle and there is a strong possibility that we may never see 80 again until the secular bear market for the dollar ends. A tag of 80 would be the spot where one would want to add to precious metal positions for the continuation of the current C-wave. Make no mistake this still has a long way to run yet. The swing high was negated that very same day as the market formed an outside day. This entry was posted in Uncategorized on October 12, 2010 by Gary.